Lighting for Weddings and Events in the South West including Devon, Exeter, Newton Abbot, Torquay, Paignton, Plymouth. 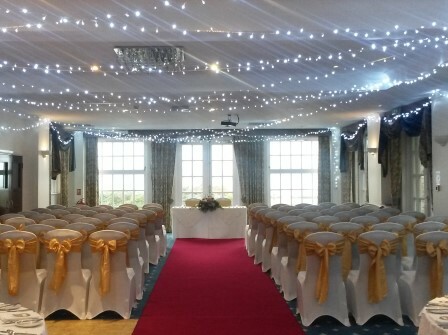 Lighting can transform any hotel function room, marquee, sports hall, village hall or barn. It can be used to hide an unwanted feature, cover walls, add a wash of colour or transform walls and ceilings with twinkling lights. Add a magical sparkle behind your table or cover an entire wall with twinkling lights and drapes. These can be in any size fixed to the wall (subject to agreement with your venue) or freestanding from 3m x 3m to almost any length you require, even going round corners. 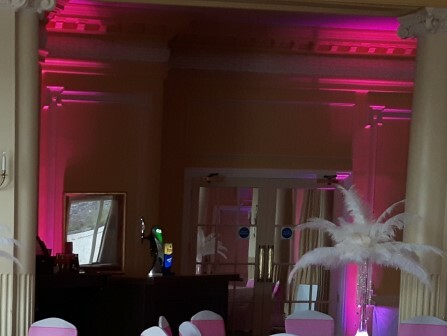 Mood Uplighters can add a wash of colour to enhance any wall or backdrop curtain and can totally transform any room. They are a great way of softening and adding romance for a wedding or adding atmosphere and colour for an event. 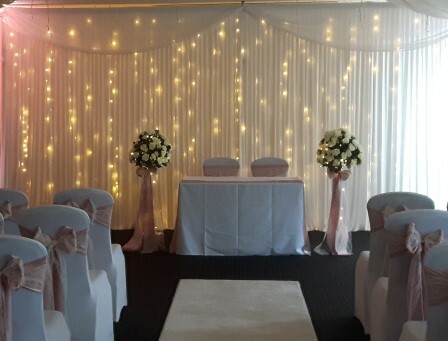 Fairy lights are an easy way of adding atmosphere and romance to any venue. They can be hung almost anywhere on wall or ceilings, even in drapes on the ceiling or walls (subject to agreement with your venue) to create a tent like appearance.